Great soccer field game for U7! This has got to be one of the best soccer field games you can play! This U7 drill is called 'Battleship Destroyers'. Take a look at the diagram below. You will need each player to have a soccer ball each (two each makes the game last longer each round). You will also need some tall cones (like the orange ones in the picture) and some smaller cones that the players will stand behind (like the red ones). This is a fun game that involves two teams standing opposite each other with a soccer ball. You will explain that the players are 'fighter pilots' and the soccer balls are their missiles. The idea of the game is to knock over the cones in the middle (enemy planes) by kicking the soccer ball at them. Start off by playing the game with no adaptations ensuring the players are kicking (passing) the ball correctly at the cones. After all the players have taken a kick at the cones you will tell them to collect them again. Give a team 1 point for each cone they knocked over. This drill is about improving passing accuracy. Try ading the below commands to change the game slightly. "Destroy the battleships" - this is the coaches command to begin knocking over the cones with the soccer balls. "Reload the missiles" - players go and retrive the soccer balls. "Repair the battleships" - players have to run in to the middle and put the tall orange cones upright. "Enemy planes are coming" - The players have to shield their ball from the coach who will attempt to take it from them. "Destroy the enemy planes" - players have to kick their soccer ball at the coach who will run around the middle of the area. "Change firing positions" - the players dribble their soccer ball across to the other side of the soccer field. "Steal the missiles" - the players have to leave their soccer ball in their own half and run in to the middle and opponents area to dribble as many soccer balls back to their are. -> Use the inside of the foot when kicking the soccer ball for accuracy. -> When dribbling, the player should take little touches using the inside and outisde of both feet. -> When shielding the ball, the player should keep their back to the coach and keep the ball close to them. 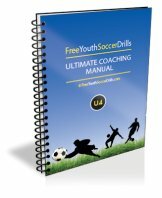 Leave this soccer field drill - check out other U7 drills!